MLBTR is launching a new series entitled "Transaction Retrospection" in which we'll take a look back on trades that have taken place to see how the players involved — including low-level minor leaguers — have fared in new settings and how the involved teams have been impacted. Remember that you can always look back at the players involved in transactions and check in on them yourself using MLBTR's Transaction Tracker. Oftentimes, as spectators of the game, we focus on the immediate impact of trades rather than the long-term impact that some major transactions have on the teams involved. For example, while some undoubtedly remember all of the players involved in last year's Andrew Bailey–Josh Reddick trade between the Red Sox and Athletics, the majority of fans likely can't name all five players. The immediate impact was apparent in Reddick's success and Bailey's injuries, but there's more to this trade than just those two names. Andrew Bailey: Bailey was supposed to take over as Boston's closer, but he would end up requiring thumb surgery in Spring Training and spend more than four months on the disabled list. Upon returning, he pitched to a disastrous 7.04 ERA in just 15 1/3 innings, walking eight and striking out 14 along the way. Bailey remains under team control through the 2014 season, so he'll have plenty of time to redeem himself and make this trade look better for Boston. However, he's been replaced as the closer following the offseason acquisition of Joel Hanrahan. Ryan Sweeney: Sweeney went homerless in 219 plate appearances, batting .260/.303/.373 along the way. He played his typically strong brand of defense in Boston, posting an 11.6 UZR/150 and saving five runs over his 467 1/3 innings, per The Fielding Bible. Sweeney was non-tendered by the Red Sox this offseason but re-signed with the team on a minor league contract late last month. 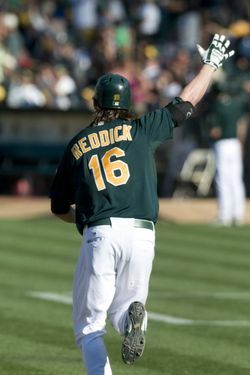 Josh Reddick: Reddick exploded over the season's first half, batting a whopping .268/.348/.532 with 20 homers. While he slumped horribly in the second half, Reddick still finished with a .242/.305/.463 batting line with 32 homers. He was worth +22 runs per The Fielding Bible and posted an equally stellar 20.4 UZR/150. FanGraphs pegged Reddick's value at 4.8 wins above replacement. Reddick won't be arbitration eligible until after this coming season and is under team control through 2016. Miles Head: Head ranks as the A's No. 7 prospect according to Baseball America and No. 9 according to MLB.com's Jonathan Mayo. The 21-year-old primarily played third base in the Oakland organization, but also has experience at first base. He hit a ludicrous .382/.433/.715 with 18 homers in 67 games for High-A Stockton before being promoted to Double-A Midland. He held his own as a 21-year-old at Double-A, batting .272/.338/.404 but whiffed in 32.1 percent of his plate appearances. BA praises his quick, compact swing and "outstanding" bat control, which create enough power to profile as a corner infielder. Head's lack of range and athleticism leave his future at third base in doubt, according to BA. Raul Alcantara: Alcantara ranks as the team's No. 26 prospect according to BA and No. 11 prospect according to MLB.com. After a dominant 2011 in Boston's organization, Alcantara struggled with Oakland's Class-A affiliate in Burlington in 2012. He pitched to a 5.08 ERA, 5.0 K/9 and 3.3 BB/9 in 102 2/3 innings of work. BA has his fastball at 90-95 mph, and they also praise his change-up's depth and armside run. Both Mayo and BA agree that Alcantara's breaking pitches need work but praise his delivery and command. Alcantara turned 20 in December, so it would seem there's plenty of time to hone his secondary pitches and develop a bit more movement on his fastball. The trade also had an impact on other players already in the organizations. Bailey's injury forced Alfredo Aceves into the closer's role in Boston for the first time, which had unspectacular results. The acquisition of Bailey was supposed to give the Red Sox enough depth to shift Daniel Bard into the starting rotation. Bard struggled, however, and when he returned to the bullpen after a Triple-A stint, he allowed 14 runs in six innings of relief pitching. Reddick's acquisition, meanwhile, replaced the power production of the departing Josh Willingham — who signed as a free agent with the Twins — and vastly improved Oakland's outfield defense in the process. Willingham's departure, the Bailey trade and the Gio Gonzalez trade allowed the A's to invest four years and $36MM in Cuban hotshot Yoenis Cespedes. The trade looks bleak for the Red Sox right now, but one of the beauties of transactions like this is the seemingly endless web they spin. For example, a strong season from Bailey could lead to another trade, causing the cycle to start all over again.